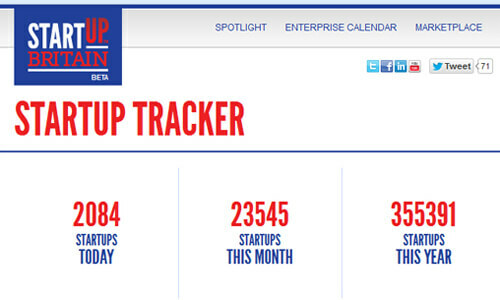 According to the StartUp Britain website, 2012 had the most business start ups in the UK on record. That’s all well and good but my question is this: what about the wind-downs and unsuccessful ventures? 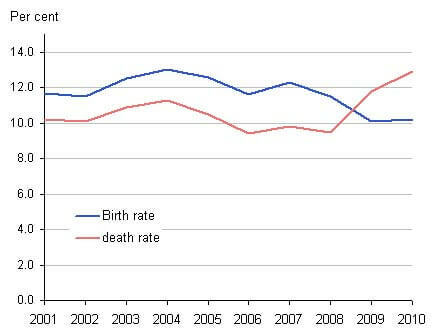 Why is start up birth VS start up death seemingly swept under the carpet? How many actually get past the first couple of hurdles and survive a good few years? Are people simply being whipped into superficial frenzy only for their business enthusiasm to fizzle out? Starting and running a business is made to look easy by those who are totally committed to it. Indeed, small business or self employment completely takes over your life. First timers are in for a massive culture shock. These stats are from a particular day in 2012. You can visit their site to see what the latest stats are. Having been made redundant in 2009 (like so many others in these tough times), buttering my own bread has been the ultimate middle finger to the banks and governments who (arguably) facilitated this economic downturn. As an employee I worked hard and was disappointed but not surprised to find myself having the “it’s not you, it’s the economy” conversation one dreary morning. 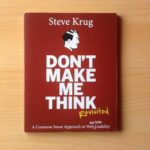 For the duration of my employment with the company I had been using my evenings and spare time to eye up business ideas. This was an opportunity to conduct research, learn the ropes, build the basics and investigate financial implications/risks of working for myself. I was “in training” for a long time before jumping into it all. Despite the due diligence and genuine passion it was NOT easy getting started but I was okay with this. It was expected. Tthe problem with the phrase “going self employed” is that self proclaimed experts or journalists are telling a naive/desperate readership anyone can do it. It’s the great orthodoxy of our time. With so many people joining the “you can do it” chorus, the notion of building your own venture has become an easy to swallow pill characterized by Chicken Soup for the Soul types of book authors. “You could always try self employment. All you need is an idea” say the media with careless abandon. These attractive sound bites are missing the all important premise of hard work and commitment. 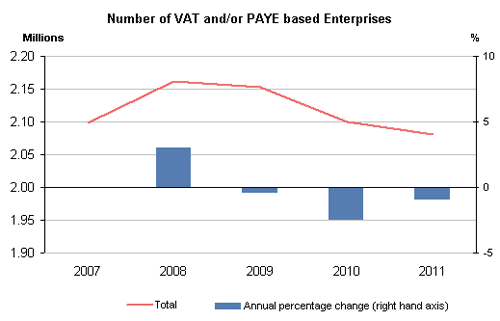 Some of the stats are interesting, because since entering recession in the UK, VAT paying organisations have declined. What the figures do not show is how many of these were start-ups that immediately or soon thereafter ceased. Of course not all new businesses register for VAT until they hit the required (current 2012) threshold of £73,000 turnover a year, but many register immediately not realising they are artificially inflating their prices for no good reason. Some businesses purposely register prematurely to portray a successful image of their company. In a recession, increasing prices unnecessarily by 20% means you may struggle to be competitive in your sector – that is if your market is price sensitive. UK businesses presently face a funding issue with banks not lending and confidence generally low. This can account for VAT de-registrations (or not registering at all) because growth is stagnated through no fault of those running the business. Some entrepreneurs are outstanding individuals in their industry but may not be able to secure the finance to penetrate their market and trade significantly. Crowd funding and private investors can separate the wheat from the chaff, but when government sponsored funding pools become available it’s all too easy to throw good money at bad businesses for the sake of hitting targets. Company Liquidations Peaked 2009, on the Rise Again? 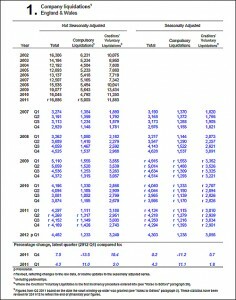 Statistics on quarterly insolvencies for the UK are published for the period from Q1 2002 up to Q1 2012 and include headline figures for England and Wales covering personal insolvencies, made up of bankruptcies, individual voluntary arrangements (IVAs) and debt relief orders (DROs), and company liquidations, consisting of compulsory liquidations and creditors voluntary liquidations (CVLs). 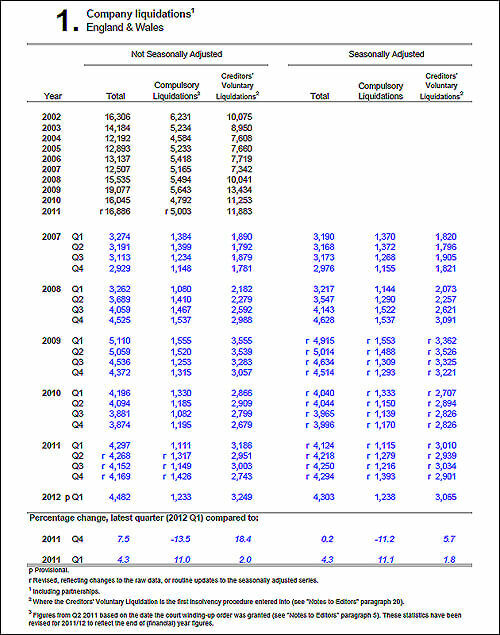 I’ve included details of each quarter from 2007 – 2012. The report was published in the first quarter of 2012 and you can get some of the reports here if you’re interested.. In 2009 liquidations peaked at 5,110 and dropped off over the next couple of years but since the end of 2010 up until the first quarter of 2012 there has been a slight increase in liquidations. This is likely because the UK sharply entered recession again in 2011. Summary of what these figures suggest: VAT (and government revenue) is in steady decline, liquidations (people who struggle to pay debt) is on the rise once more, but business start ups are off the chart, sky rocketing. What the bloody hell are these new start ups doing then? Are they trading and making a turnover? Is it a half baked desire or half hearted effort from ex-employees who cannot adjust to a new work culture? I’ve seen businesses come and go in my town and know how easy it is to become a casualty. Example: The NHS could publish figures showing how many people stopped smoking in a certain period, but would the same report account for relapses? Tthe government and their quangos can bang the drum for new business all they like but they say little about the reality and survival rate. The data below shows, between 2001 and 2010, overall, there were more active businesses. But look at the columns “Births” and “Deaths”. 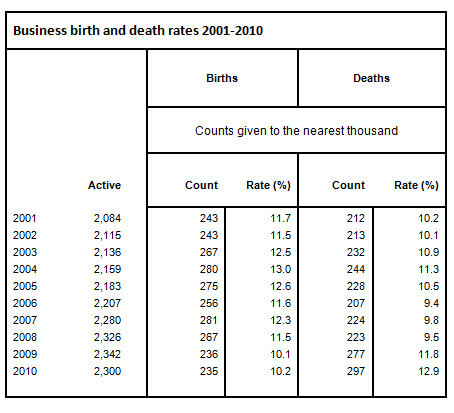 Up to and including 2008, business deaths were fewer than births. And 2009 onwards saw more failed business compared to start-up businesses. It’s my suspicion that this dramatic increase accounts for some of the have-a-go-heroes of the business world who found themselves in over their head. Maybe they’ve watched too many episodes of the Apprentice! I also believe a lot of well run and previously successful ventures probably failed simply because of the economy. Some industries really suffer but a lack of innovation (or passion?) causes some businesses to just give up. One thing worth mentioning is that people DO lose interest in their own established business. My former boss was heading for retirement age and it was apparent our little rowing boat of a company was in fact a sinking ship without captain. We were not getting orders, we were doing no web marketing or promotion, and the SEO was so bad we ranked on page 10 on Google. The competitors had us over a barrel. With the economy breathing down our necks it was not surprising to see a round of redundancies. If you’re starting up, and are facing all the above challenges without even having yet made a profit, can you honestly say your full attention is on the task at hand, or will you sideline your responsibilities and give it all up? For a large proportion of people, business is nothing more than pipedreams and pea cocking. It’s something to talk about in the pub, so they can puff out their chest and feel important. That approach is all crap. You might have to work a job part time and be prepared to do some unglamorous plate spinning. Will You Put the Work In? The data and statistics seem to indicate unfavourable trends for budding entrepreneurs although Vince Cable’s £10 billion business support fund is (sort of) encouraging. I hate to think that this money is wasted on meetings, conferences and pamphlets blowing the trumpet for business without anyone actually doing anything. Capital investment can never take the place of hard work. A person who can creatively bootstrap a business is more able to maximise the use of a cash injection. They appreciate the value of money whereas a cavalier daydreamer will run up silly debts. Someone I know regularly loses money in the casinos, orders takeaway food most weeks, drinks heavily and buys expensive gadgets. He overspends and has the tenacity to complain about it afterwards. He tried to start a business – and failed. To him, the roulette wheel is more tempting for making money because it is “fun” and there is no work involved. This behaviour is indicative of one who would take shortcuts to success. I don’t want those people flirting with notions of self employment because I don’t want them getting hurt and taking others with them. They shouldn’t be allowed near a business if their own emotions and finances are out of control. There is a different between wanting money and running a business. I really do not mean to discourage anyone from pursuing success. It’s sounds very negative and you might think I want people to fail just so I can make a point. This is not true at all. I am simply fed up with lazy people who do not make the effort. They don’t know they’re lazy to begin with. I am certainly not a perfect person nor do I try to be. I am interested in self improvement and learning. What I cannot STAND is self deluded bravado from the sorts of people interested in appearances. Those types of people will obviously end up in the next series of The Apprentice as cheap television cannon fodder. You Can Do It Can You Do it? Do you really want to be self-employed or a small business owner? What is your attitude? How will you cope with failure and rejection? Can you admit and learn from mistakes? Will you remain humble whether you win or lose in the game of life? What about patience and hard work? Whatever you do, do not set yourself up for disaster. And do not becoming one of those chest beaters we repeatedly witness on TV business programmes. They are poor examples and are there only to entertain us during prime television slots.